Webster's director of Athletics, Scott Kilgallon, has accepted a position on the newly formed NCAA Division III Faculty Athletics Representative Engagement Working Group. The charge to create the working group comes from the NCAA DIII Management Council. The goal of the committee is to increase the engagement of Division III faculty athletics representatives (FARs) at the institutional, conference and national level. Kilgallon, already with a full plate running the Webster Athletic Department and serving on the NCAA III Convention-Planning Subcommittee, feels it is important to take on this task as well. 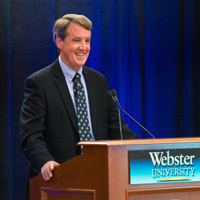 "It is an honor to serve on this committee and represent Webster University on the national level as we continuously work toward improving the student-athlete experience," said Kilgallon. The faculty athletics representative was a position created by the NCAA to provide oversight of the academic integrity of a University's athletics program, and to serve as an independent advocate for student-athlete well-being, and support institutional control of the athletics program.